Sev Trek: Forager is a cartoon satire of Star Trek's Voyager and part of the Sev Trek website. Captain Gainweight and her crew are stranded in the Deltoid Quadrant. 70 years away from the Alfafa Quadrant, they must find a way home, while collecting and hoarding resources from planets and sevspace doobythingies on the way home. They are the Sevship FORAGER! This cartoon was first launched in the Sev Trek Book but seeing as it'd been available for several years, I decided it was high time to publish it online. It's probably my favourite Sev Trek cartoon so far. Here is the longest Sev Trek cartoon I've written yet and arguably the funniest (in my opinion anyway). The 13 page epic has the Forager crew cloned, although their doppelgangers have one difference to the originals... they're interesting! Thanks to everyone who suggested sevnames. Roger Burns sent the alternative for Kathryn (Janeway's first name), Jacqueline Mellor first suggested 7 of 9's alternative name & Nathan Gilchrist was the first of many to send Q's Sev Trek name. The first cartoon featuring the Sev Trek versions of 7 of 9 and the omnipotent Q. Note: Q was very difficult to caricature, having no distinctive features. However, 7 of 9 had several features I was able to work with and was a pleasure to draw! :-) This cartoon is a tribute to the Wizard of Oz and I encourage you to compare the end of the movie to the cartoon. This cartoon is the most time consuming I've drawn yet so enjoy! The very first Forager T-shirt is now available for sale! 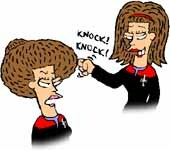 It features Captain Gainweight and her enigmatic hair in what is probably the most popular Sev Trek comic strip to date. This cartoon is very much the sequel to The X Generation's To Politically Correctly Go, as the Forager crew carry on the torch of Political Correctness. A number of the Sev Trek comic strips are based on Forager. While I recommend you go directly to the Sev Trek Comic Strip page and read them sequentially, you can link directly to the Forager strips from here if you like. #26: The emotional hollowgraphic doctor. #35: Gainweight's hair as kindling. #36: Are we there yet? View caricatures of all the Forager crew and read descriptions about each of them.